Designed specifically for card magic, the cards in this deck feature a mnemonic card stack order for you to perform powerful card magic straight out of the pack! These decks also feature our level 1 marking system that allows you to visually know any card's orientation/location in the deck! This is achieved via a slight alteration on the card backing design that creates a discreet 'one way' card backing. This system is perfect for changing the orientation of any card/cards in the deck to later retrieve at any time. These pre-loaded decks also include 1 gaff card plus 1 hidden reveal, with many tricks specially designed to be performed straight out of the pack! Each Silver Dragon Deck also contains a secret password and Q code link to a secret magic website. Here, you can unlock all the secrets to each deck in the series, as well as learn some of the best card magic routines that are used by top magicians around the world! 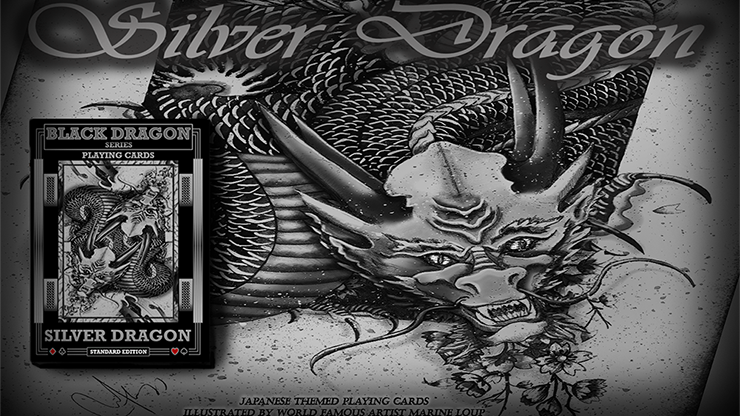 Silver Dragon (Standard Edition) Playing Cards is the 3rd deck in the series from the Black Dragon Series of Playing Cards. Decks contain 54 premium quality playing cards featuring Japanese-themed illustrations by world famous artist, Marine Loup. "From unleashed dragons, samurais, and Katana blades, to symbolic Koi fish representing an ancient legend, these cards have been created specifically for card magic, while being designed to capture the imagination." 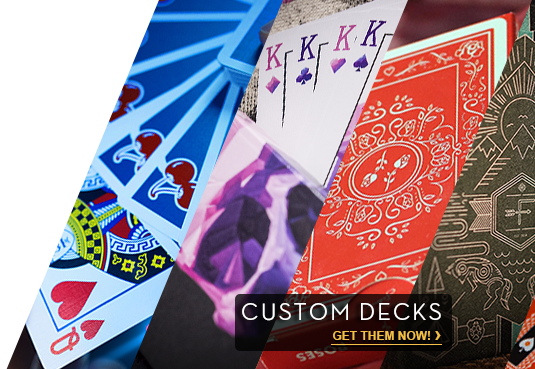 These decks are designed and produced to meet the needs of a broad range of card enthusiasts worldwide. They are made from a very professional 310gsm casino paper cardstock with added air pockets that offer better handling. Each card also contains the added quality of a black core layer center to block light shining through. These are perfect for professionals who require top quality cards. With the superior card handling and durability that these decks provide, they are a great addition to the toolkit of any cardist or magician. Silver Dragon Playing Cards can be used in conjunction with other dragon decks from the Black Dragon Series of Playing Cards to create added magic effects for card trick performances!